Police block the road near the shooting at a mosque in Linwood, Christchurch, New Zealand, Friday, March 15, 2019. Multiple people were killed during shootings at two mosques full of people attending Friday prayers. (AP Photo/Mark Baker). Police are increasing patrols around places of worship today in a bid to 'reassure' communities after the New Zealand terror attack. Forty nine people have died and at least 20 have been wounded in the shootings at two mosques in Christchurch, in New Zealand. 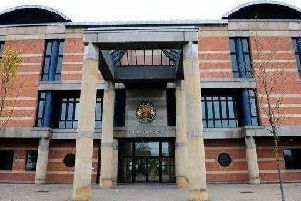 A man in his late twenties has been charged with murder and will appear in court on Saturday morning, police confirmed. Two other men and one woman were detained nearby and firearms seized - one of those detained was later released, while officers were working to understand if the other two were connected. Police also found multiple explosive devices in a car. Security Minister Ben Wallace confirmed the UK was offering whatever assistance New Zealand required in the wake of the "repugnant" attack, adding both he and Home Secretary Sajid Javid were meeting police and security services to look at ways to protect British mosques. Cleveland Police's Assistant Chief Constable Adrian Roberts said: “Our deepest sympathies go to all those affected by recent events in New Zealand. “Despite these events, the local threat level for Cleveland, mirroring the national threat, has not changed. “We understand that there may be increased concerns amongst local residents and therefore we are increasing the visibility of our neighbourhood patrols today to offer reassurance to all of our communities, particularly in places of worship. “Acts of terrorism are committed by a small minority of people and are not representative of the public. “We are aware that there is footage from the attack available on social media, however, we would echo the warning from New Zealand Police by asking the public not to view this or share it due to the extremely distressing content. “Again, we would reiterate that whilst there is no specific intelligence to suggest any links to the Cleveland area, we urge everyone to remain vigilant as always. “Our message is to be alert but not alarmed, to report suspicious activity and in the unlikely event that a terrorist incident does take place to follow the ‘Run, Hide and Tell’ principles. “If anyone has been directly affected by this incident, through family or other links, they should contact the police. Cleveland's Police and Crime Commissioner, Barry Coppinger tweeted: "My office and I send our heartfelt condolences to those affected by the horrific atrocities in Christchurch. "We all have a role to play in tackling hatred in all its forms and by standing together we are stronger than those who seek to divide us."